The Listening Room helps determine suitable speaker and listener positions so as to avoid the negative effects associated with standing wave buildup within the listening environment. equalization and reduces transient decay time. further work will be required. is often the best. Note that a corner location is usually the worst of all. OVERLAPPING markers which stray upward from the grouping should be avoided. number of markers should be toward the bottom of the chart. such as an electrostatic system. early reflections and allow a believable sound stage to be established. 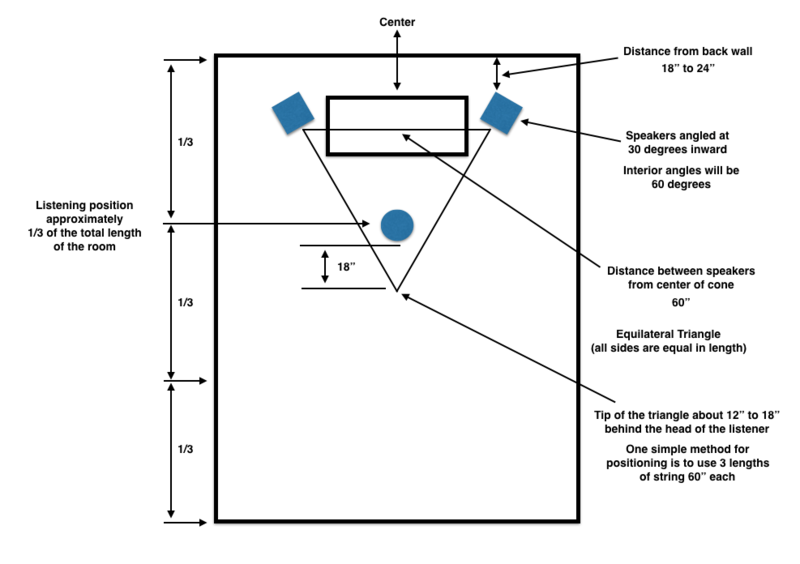 woofer and satellite positioning as separate exercises. than a complete absence of sound. techniques available, be sure to locate your speakers prior to the procedure. can sometimes make a significant difference. it easy to compare one set-up curve with another. boundary plot as closely matched as possible to maintain L-R channel balance. Room: 180" x 144" x 102"
Speakers from front wall: 60"
Speakers from side wall: 48"
Listener from rear wall: 34"
juggle things into place for this example. it may already be perfect. often do not coincide with a reasonable listening configuration. transient response suffers and an equipment problem may even be suspected. markers and distances to the Rule of Thirds or the Rule of Modified Fifths. 7ths but it does not provide satisfactory results. mode must be selected in order to move all the W markers into the grouping. your questions and provide any advice in areas which we are knowledgeable. you don't believe we have done our job, let us know. The program is compiled with the Microsoft BASIC 6 compiler. Audio Concepts Quality drivers and loudspeaker kits. CD Review "The" magazine for CD buyers. KLH Research & Development Loudspeaker manufacturers. Stereophile Respected "Underground" review publication. Speaker Builder Hobby magizine for speaker building. IBM is a registered trademark of International Business Machines.